Light remnant is one of the main headaches connected to the use of LED luminaires when light is “switched off”. That is why JISO ILUMINACIÓN has decided to write about this issue. Perform line checks, the neutral without direct current to DRIVER/LUMINARY and the phases to switch elements. Connection order: connect the LED luminary to your DRIVER, then connect the Driver to the Line and finally introduce the current. 2- Each DRIVER with the appropriate LED luminary! The power supplies (DRIVERS) are electronic devices and not merely transformers. They deliver regulated voltages and currents and have direct current outputs, so respect connections and polarities. CAUTION especially in installations which feature different LED luminary models. Check the driver, the type of current, the voltage and the polarity, taking into account that the current can be 300mA, 350mA, 600mA, 700mA, 1000mA, etc., and that the output current of the driver is continuous. 3- Wiring. 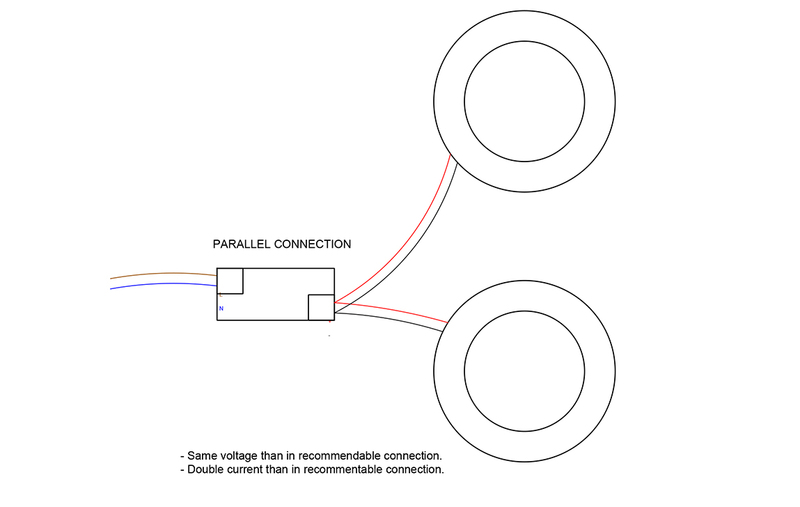 Splices and Connections. 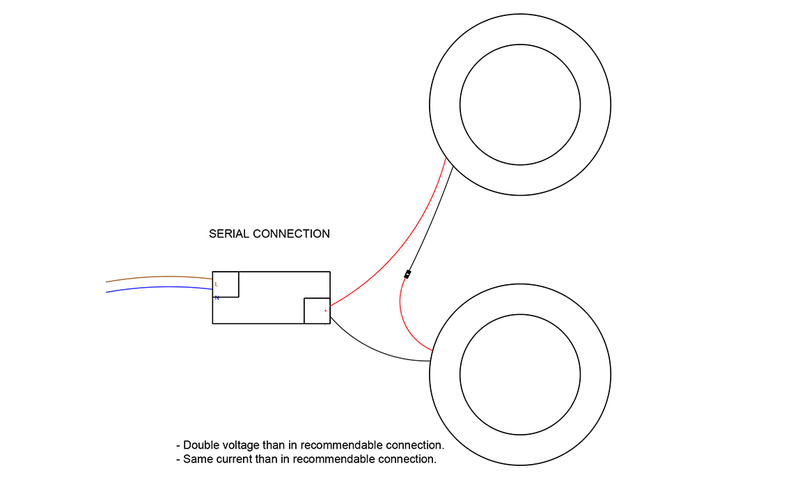 It is important to use suitable section wiring, considering that the current required is very small. The splices require welding and insulation with heat shrink tubing or tape. 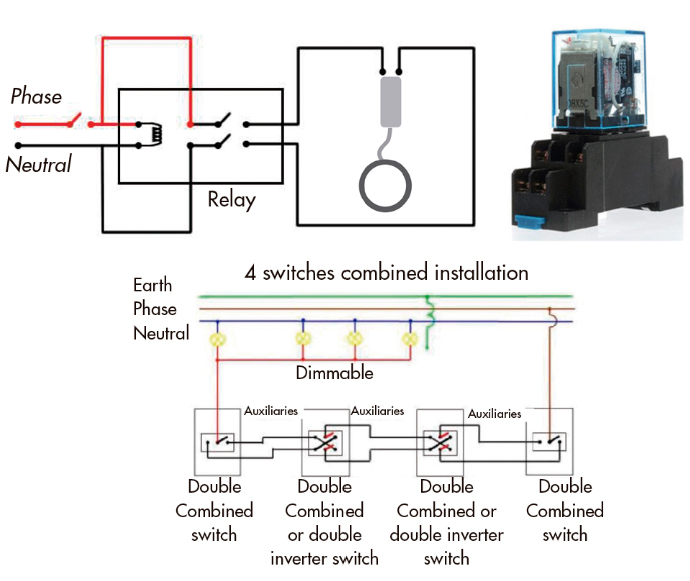 Observe the connections, whether they are series or in parallel according to the manufacturer’s installation recommendations. 4- It may be that the LED luminary is giving off any light but always remember that current is still circulating in the system. If you encounter any issue, please give us the opportunity to resolve it before returning the product. Most technical assistance questions can be answered through our knowledge base on the website: www. jisoiluminacion.com, or via the technical support service by email: asistenciatecnica@jisoiluminacion.com. The use of the electronic elements and parts of the installations can cause some very specific and sporadic incidents which do not damage the LEDs but which are striking, such as residual luminescence (brightness), flickering or switching off shortly after installation (temporary block which works by removing and returning the switch). All these effects existed previously but were not detected because lighting technologies were not as efficient; a lot of energy was needed for their operation and the “residual” voltages, the induction generated voltages, the commuted point installations and the mechanisms with light signal did not affect them. 1- The switches of the electrical installation cut the neutral whereby the phase reaches the LED. 2- Current flows through the neutral, due to earthing shunt or other causes. 3- Induced current. This can be generated by the presence of large household appliances or industrial achinery. 4- Pilot signalling switches (Neon or LED). This type of switch admits a current of 12 to 30 volts. 5- In switched-point installations, a residual voltage may be produced (due to the length of the crossing lines) which acts as a capacitor generating small voltages which can maintain some brightness, flickering or blocking of the LED luminary driver. 6- The installation has two active poles so there is always potential in one pole of the driver. 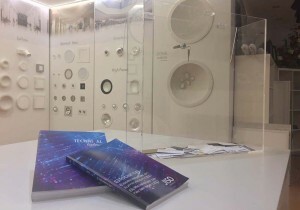 7- The ceiling where the luminaire is placed has electrical conductivity and, as a result, the contact between the ceiling and the luminaire body thanks to the existence of an active pole connected, makes possible to have potential and remaining light. In points 1, 2 and 5, we recommend checking the electrical installation. 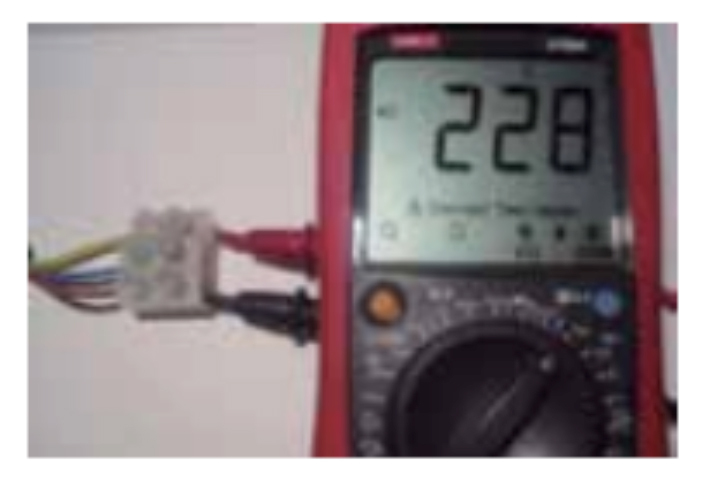 To easily check if it is neutral or phase, we can use a pole detector, or Multimeter/Tester. - When you touch the phase conductor with a pole detector, the neon light shines. In the new models with a LCD display showing the voltage, when you touch the phase it will read 220V. - In pole detectors, neither the neutral nor the earth triggers the neon light. And in the pole detectors with a LCD display, no voltage is indicated for the neutral or earth. Between phases – neutral 220V-240V will be indicated. Between neutral and earth 0V. Another possible solution in cases of residual current would be to install a capacitor of 0.47uF 400V (Solution points 3 and 4). You can also use bipolar switches or contactors to count the current flow to the lighting lines. (Solution points 3 and 4. This last mechanism would allow, in any case, to eliminate the remnant of light so, when the power in the driver is removed, the driver could not be put in tension in any case. Third document of our technical news serial is focused on other question repeated over the time that we have to explain it constantly. Clients ask for information regarding the use of one constant current driver to feed several light sources. Remembering last article, our luminaires integrate two components, one driver or converter and one light source. 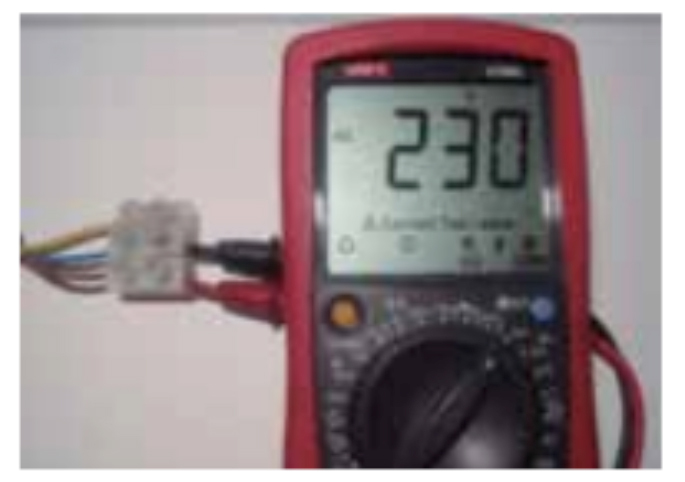 T his configuration it is highly recommended by us and we always indicate the use of our products following this so we do not recommend the connection, in serial or parallel, of several light sources in a single driver or converter. Above you can see the explanation because of JISO ILUMINACIÓN, SL. 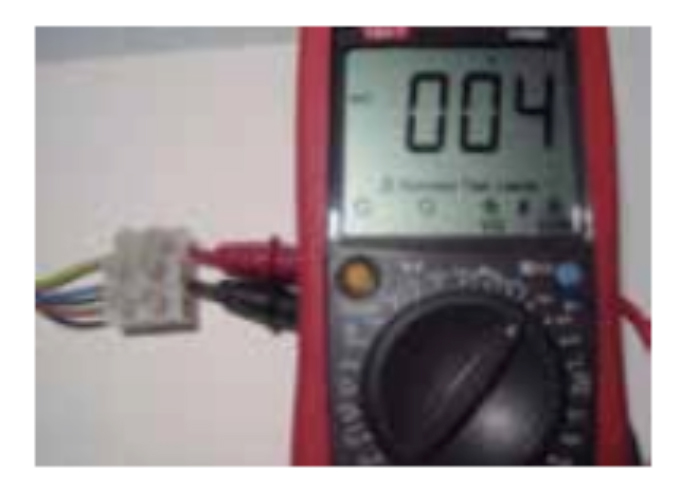 does not recommend the connection, in serial or parallel, of several light souces in a single driver or converter. 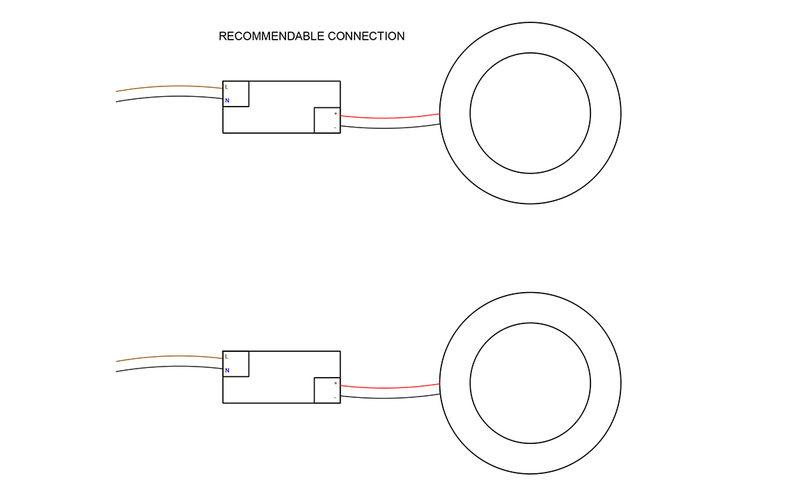 This kind of connection would be the less recommendable so, when we connect several light sources to a single driver or converter, the driver has to be able to feed a current (contantly) equal to the sum of the design currents of the light sources associated. For example, If we connect 3 light sources designed to work with 300mA, then, the associated driver or converter must be able to supply 900mA. The problem appears when one light source is not connected properly, or it appears a failure, or any source does not receive the energy correctly, so, in that case, the current, which should be divided equally between light sources, it is divided incorrectly and the other light sources received more current than the one they need. For example, in the example shown above, if one light source is not switched on it is produced, as a result, an increasement in the current of the others and, in that case, instead of 300mA, each light source will receive 450mA. This can generate an overheat in the light sources and the consequent failure. If one more light source fails then the last one will receive 900mA so in a small period of time it will fail as well. This kind of connection, although it is less problematic to the light sources, it would not be recommendable either. In this case the driver has to be able to supply the design current (constantly) of the light sources and, besides, it has to be included, in its voltage range, the sum of the voltages of the light sources (the load of each light source). For example, if we connect 3 light sources which are designed to work with 300mA and 36V, then the associted driver or converter has to be able to supply 300mA and within its voltage range will have to include the sum of the three voltages (108V). For example, a voltage range of 75-120V. The problem appears when one light source is not connected properly, or it appears a failure, or any source does not receive the energy correctly, so, in that case, the continuity of the system is broken. For example, in the example shown above, if the light sources are not switched on, the continuity of the system disappears and, as a result, every single light source is switched off and we never know exactly where the problem is focused so we will have to waste time in order to find out the problem. Therefore, JISO ILUMINACIÓN, SL. only supply luminaires which integrate one light source and one driver or converter, and we do not recommend the use of any other kind of connection in other to keep the warranty available because otherwise the warranty will disappear. The second instalment of our technical news serial is focussed on one question which is becoming common in installation where our products are used but where customers need less brightness than luminaires generate normally. Use of a dimmable driver regulating the brightness with a compatible dimmer. Use of a driver with lower current than standard current of the product but with an output voltage range in Direct Current (DC) in which the voltage of the luminaire is included. Option 1 would be the most recommendable so it allows a better integration of the product in the area where installed and, besides, it provides the possibility of variate the brightness when necessary. However, and once said this, in following paragraphs we are going to talk about the second option as this is the one demanded from customers and it is the most unknown as well. In future documents we will write about issues related to brightness regulation by using different kind of dimmable drivers and their accessories to be controlled. We must take into account we have two different items in luminaires; on the one hand we have a driver or converter, which converts the supply from altered current (AC) to DC, and, on the other hand, we have the light source, which works in DC and is fed by the driver. Therefore, when a luminaire is designed the specifications related to current and voltage, in DC, of the light source integrated must be taken into account because the coupled driver must be able to meet them. For example, if we have a light source running with 700mA and 36V, then we need to feed it with a constant current driver not only supplying 700mA (continuously) but also with a voltage range in which 36V is included (it could be 27-42V, for example). In the previous example the luminaire would be working in optimal conditions. But there is a chance, when possible, of modifying the way to supply the current from the driver (with lower values), in order to reduce the power consumed and supplied by the luminaire, permanently and without any possibility of changing it by using any dimmer. For example, using the same light source as before (700mA and 36V), we could couple it with a constant current driver which supplies 350mA and with a voltage range in which 36V is included (it could be 27-42V, for example). Therefore, thanks to the driver with 350mA we get half power, consumed and supplied, to be used in installations which require this effect. Obviously, the information indicated above could not be possible in all cases so it is mandatory to use drivers which are able to meet with the features of the light source, regarding to voltage and the current they supply. Normally, the luminaires in which the light source works with 300/350mA do not have the chance to reduce their brightness by this way and, as a result, they need to be regulated by using a dimmable driver. If you need a product with the features we have described do not hesitate to contact us and we will help you to study and define the best method to get it. In recent times we have received several questions and requests relating to the necessity of lighting compatible with Central Battery Systems (CBS). Consequently, JISO ILUMINACION, SL. has decided to begin its News writing about it. 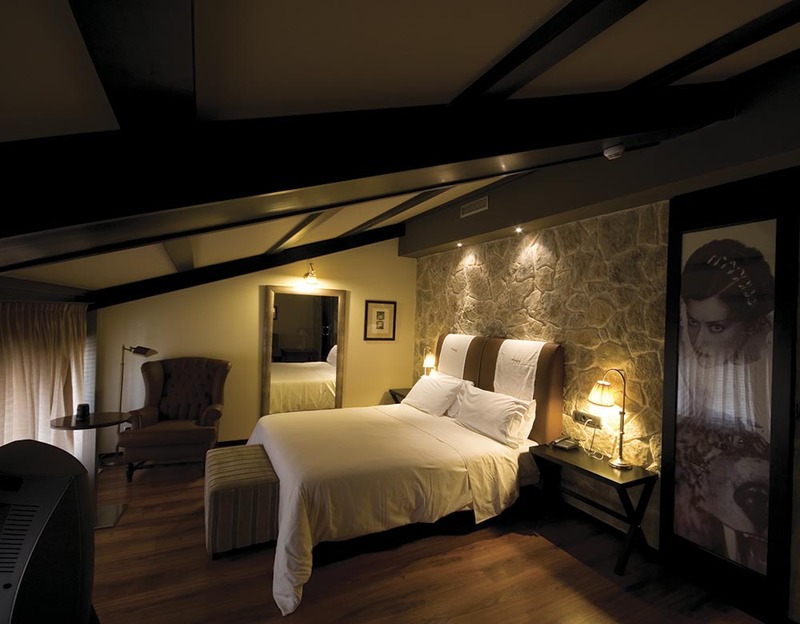 Before starting, it is highly important to have into account that the luminaires supplied by JISO ILUMINACIÓN, SL. are NOT emergency luminaires and that the systems we are talking about do NOT make them emergency luminaires either. These systems just allow the luminaires to continue running for a specific period of time after an electrical shut down. Besides, a distinction must be made between the two typical systems which supply energy in emergency cases: on the one hand, there are Centralized Systems (Central Battery Systems – CBS), in which a centralization of batteries feed the luminaires in direct current (DC) allowing to achieve a similar power than with a normal supply and, on the other hand, there are Decentralized Systems (EM Kit – Emergency Kit) in which each luminaire has an individual supply system with one or more batteries feeding it in DC, allowing to achieve a power between 3W and 7W. In this article we are going to focus on CBS only. Focusing now on the matter of the present document, CBS integrate a central module, one single battery or a bank of batteries and the luminaires associated, together with the cables required to make the connections. The luminaires, which are the elements where JISO ILUMINACIÓN, SL. takes part in, can be not only conventional emergency luminaires (NOT supplied by JISO ILUMINACIÓN, SL.) but also luminaires integrated in the lighting circuit which, maybe all of them or maybe someone located strategically, are intended to keep running after a main supply failure. In this case, normally, unlike the applications with EM Kit, the luminaire will have the same brightness as when working fed by the main supply, but it will be fed in DC from the batteries instead of alternating current (AC). Therefore, the drivers of the luminaires integrating the installation must meet specific requirements because they will have to be able to be fed by AC and DC. Besides, they will have to meet with the voltage input ranges of the central battery supplies, so that not all drivers will be able to be used with this kind of system. JISO ILUMINACIÓN, SL., after several projects with CBS, has decided to create a new reference code for the luminaires prepared to be coupled with a driver compatible with CBS. This code can be identified with a 7 placed after the first five numbers of the references (ex. : 51022-7284-90). 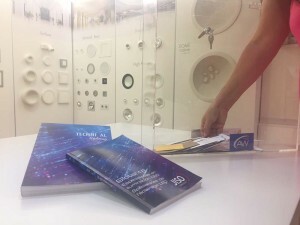 Therefore, customers will be able to detect those luminaires which are compatible with CBS in our new catalogue as well as they will find information regarding CBS. 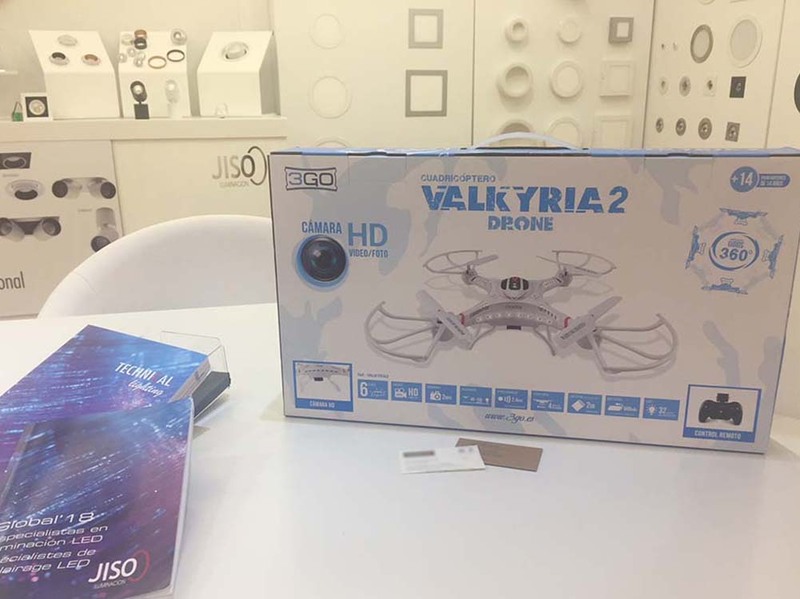 JISO Lighting has now drawn the drone winners out of everyone who took part during Light & Building 2018, an international trade fair for the lighting sector that was held in Frankfurt (Germany) last March. 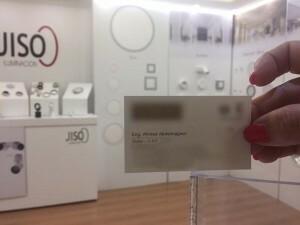 The JISO Lighting stall had a great flow of people who were interested in all our products, both interior and exterior. In addition, at this edition of Light & Building, JISO Lighting wanted to showcase something very special to their visitors. After considering all the options, they went with drones because of the small aircraft’s popularity and people’s interest in them for both leisure and their many uses in the field. 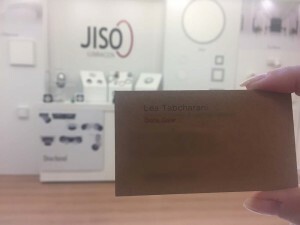 Therefore, everyone who visited the JISO stall could put their card into a hat! Loads of people took part and the draw was held at the company’s site in Chiva (Spain) on the 14thof August. The lucky winners were Ahmed from Dubai (United Arab Emirates) and Lea Tabcharani from Doha (Qatar). Both offer lighting solutions in their respective countries, based on quality, design and great value. This competition was one of the attractions at the JISO Lighting stall at Light & Building 2018, where all our company’s innovation was on display to architects, designers, decorators, buyers and professionals in the sector. The space was designed by JISO director, Mª Carmen Giménez. It was an elegant space with LED technology and contemporary designs by the Valencian company. As well as all the innovation and luminaire ranges available in the JISO Lighting 2018 catalogue, the new outdoor luminaires and the brand-new Nature Dome were also showcased, a light inspired by nature with handmade decorative features. Fresh designs, with handcrafted and personalised finishes, that attracted the interest of those taking part in the competition. All our products are of course, designed so that JISO Lighting customers can have exclusive and custom lighting. All this in a large area with interactive zones to try our adjustable lighting controls, as well as tablets to browse the latest designs. Also, at the stall there was a small bar so our guests could have a drink while chatting and a photocall featuring the raffle box. The international Light & Building fair in Frankfurt, which takes place every two years, is one of the most important events in the lighting sector. It brings together three extremely relevant areas of building planning: lighting, electrotechnical and home-automation. In addition, certain architectural services are also displayed. It unites more than 2,700 exhibitors from 55 countries and more than 200,000 visitors. 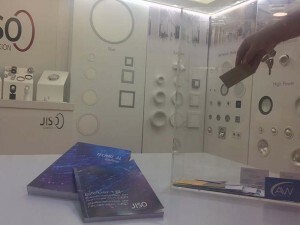 JISO Lighting, just as in previous editions, was one of the 104 Spanish companies that exhibited their products and lighting solutions at the event. When choosing the lighting for an industrial building, you have to think about the safety and comfort for the employees. Reducing levels of visual fatigue, providing good visibility and ensuring welfare within the company are three factors that influence the quality of production. Something this is certainly in the company’s best interest. However, we must also bear in mind energy savings. According to the Institute for Diversification and Saving of Energy (IDAE), the industrial sector is responsible for 31% of energy consumption in Spain. In addition, 10% of the electricity bill of a manufacturing facility comes from lighting expenses. Therefore, it is important that the luminaires chosen to light that establishment use LED technology. This technology provides great energy savings, a longer life compared to traditional bulbs, as well as a significant reduction in costs, both in maintenance and in the electricity bill. At JISO Lighting, both these notions are at the forefront of our Industrial Collection. The four models of luminaires have LED technology, which maximises their lifespan and, in addition, they offer an optimal heat dispersion. These models can be used both outside and inside, and they each have their own significant advantages. Our new high-bay 05 offers great reliability, thanks to its LIFUD driver, and has a 5 year warranty. Its new design and lighter weight make it easier to install, while remaining robust and highly vibration resistant. This model is available in 4000k light, which gives a neutral light, very similar to the natural one, or in 6000k light, which is cool light that generates a perception of greater luminosity (similar to that of a very sunny day). This industrial high-bay is designed to be installed suspended and is suitable for conditions with large amounts of dirt, dust, humidity and extreme conditions. The 008 and 08 models are projectors specifically designed for outdoor lighting, but they can also be used inside buildings and work areas. Their attractive design makes them ideal for small walls, outdoor furniture, doors or pergolas for example. They are available in cool or neutral light and in different sizes, so you can choose exactly what you need. Models 008 and 08 stand out for their energy efficiency, reliability and long lifespan. Another surface model of the industrial collection is the water-proof screen (model 004). They are also designed for outdoors but are perfect for industrial use, such as interior building lighting, due to the lighting capacity they offer, as well as their level of energy efficiency and their high-quality waterproofing, which protects them from moisture and external particles. The JISO Lighting water-proof screen are available in different sizes, to fit your needs, and in 4000k (neutral light), although we do stock some with 6000k light (cool light), if you need it. 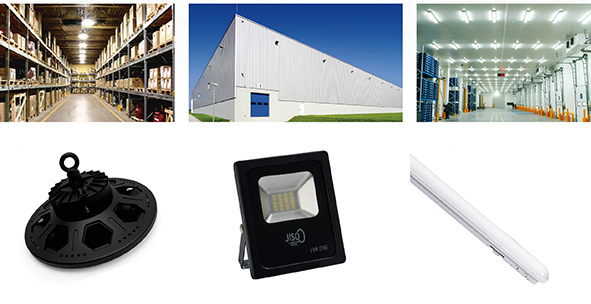 At JISO Lighting we have a wide range of products to help you choose the best for your company. Functionality is not at odds with aesthetic. Nowadays, lighting design is working on the combination of these two concepts. Luminaries have to offer lighting efficiency at the same time that they have to fit with the decoration. That’s how we accomplish lighting requirements and, at the same time we achieve good aesthetic and decoration levels. A good example of this combination between functionality an aesthetic is our Downlight LED Narrow Collection, designed by Jiso Illumination. The design of this type of luminaires makes possible not only high ceiling installations (surface luminaire) but also false ceiling installations (recessed luminaire). In addition, this luminaire has an excellent aesthetic and design levels; Its pure and elegant lines, in round and square models, make possible its collocation in any type of decoration. Moreover, for further elegance and differentiation all our models come with a sober and minimal trim ring, it is available in aluminum or white colour. Usually in the case of this type of luminaries the value of design it is not a key issue. However, Jiso Illumination wants that each component of your lighting installation has an aesthetic that makes the difference in your decoration. And at a competitive price! The new Downlight LED Narrow collection of Jiso Illumination, with its LED technology, maximizes energy efficiency and durability (it will last up to 50.000 hours). Thanks to all these qualities, this type of luminary is perfect for work spaces where it must be provided constant artificial lighting. In addition, this luminary has a colour temperature between 3.000 and 4.000K. Furthermore, these lamps combine perfectly with other luminaries in your work space. Its sober and elegant design makes possible that they harmonize in any type of decoration, from the classic to the avant-garde. The Downlight LED Narrow Collection can also offer a great tightness that protects the inside of the lamp from humidity and dust. In this way, failures and operational problems can be avoided, and as a result lamps service life is increased. Choosing our new Downlight LED Narrow model of Jiso Illumination, you are doing the right choice. Our luminaires offer quality assurance, safety and a good design and functionality. All that you need to light big spaces without doing such a great inversion. Il n’y a pas aucune raison pour laquelle fonctionnalité et esthétique soient incompatibles. Actuellement, le design de luminaires parie de plus en plus sur l’unification de ces deux concepts. Les luminaires doivent assurer un bon éclairage, au même temps qu’ils doivent s’harmoniser avec le décor. Cette combinaison est le secret pour garantir des espaces non seulement avec une esthétique et un décor soigné, mais aussi un espace qui répond aux exigences d’éclairage. Un bon exemple de ce fait est la nouvelle collection de Downlight LED Narrow de Jiso Illumination. Ce type de luminaires a été désigné pour être installé dans les hauts plafonds (surface) et aussi sur faux-plafonds (encastré). En autre, Ce sont des luminaires avec une excellente esthétique et design, appropriés pour n’importe quelle décoration. C’est à cause ses lignes douces et sobres, tant au modèle carré comme au modèle rond. En plus, ces luminaires sont disponibles en différents tailles pour s’adapter à votre installation. Par ailleurs, tous nos modèles ont un discret et minimal boîtier en aluminium ou blanc froid pour une plus grande élégance et différentiation. Ce n’est pas habituel d’avoir la possibilité de modifier le design dans ce type de luminaire. Mais dans Jiso Illumination on veut que chaque luminaire soit unique, avec sa propre design et son valeur décoratif. En plus, à des prix compétitif ! La nouvelle collection Downlight LED Narrow de Jiso Illumination intègre une technologie LED, qu’assure son efficacité énergétique et une durée de vie moyenne de jusqu’à 50.000 heures. Grâce à toutes ces caractéristiques, ces luminaires sont parfaits pour des lieux de travail qui ont besoin d’un éclairage artificiel continu. En plus, ce luminaire a un couleur de lumière de entre 3.000k et 4.000k. En autre, ils vont s’intégrer parfaitement avec d’autres luminaires que vous voulez installer dans le lieu de travail. Son design minimal, discret et élégant permet son emploi dans n’importe quelle décoration, bien qu’elle soit plus classique ou plus moderne. On doit parler aussi de son étanchéité, qui protège l’intérieur de l’humidité et des particules. Ça permet d’éviter des pannes et des problèmes de fonctionnement, et par conséquent prolonger leur durée de vie. Vous ferez le bon choix avec nos modèles Downlight LED Narrow de Jiso Illumination. Nos luminaires offrent garantie de qualité, sécurité, design et fonctionnalité. Tout de ce que vous avez besoin pour éclairer n’importe quel espace et sans besoin de faire une grande inversion. Last wednesday 30th of may, our CEO Mª Carmen Giménez and the responsible of the technical department, Javier Lacalle, were assisting to a Master class organized by the ESIC Business School in Valencia. At the conference, Miryam Encabo Martín, who is graduated in Information Sciences and the responsible for carrying out of the Master Class, talked about Communication as the main tool for human being. She explained how managing information in an efficient way may improve our chances of success in life. Miryam also talked about how move the audience with our words and how connecting with people by using efficiently all our communication skills. After all, it is about connecting with people in a deeper way by showing all our charms in order to create real MAGIC. This Master class enabled us to learn more about communication skills, share experiences and have a very pleasant time. L’éclairage des grandes espaces, comme par exemple des lieux de travail, des centres commerciaux, des hôpitaux et des hôtels, c’est un facteur à lequel on doit faire attention. Un mal éclairage peut provoquer des accidents, il peut empêcher que des employées fassent bien leur travail ou même il peut modifier l’humeur de ceux qui occupent l’espace. On ne doit pas oublier que ce modèle 51533 High Power de JISO Illumination a une apparence très attractive. Son principale caractéristique est son diffuseur qui est placé en retrait par rapport au contour du luminaire. En outre, il a un design soigné avec des lignes douces. Tout ça permet avoir un luminaire très versatile et capable de s’intégrer dans n’importe quel décor, surtout en espaces techniques ou minimalistes, qui sont si très habituels aux grandes espaces. En plus, le modèle 51533 High Power utilise la technologie LED, cette caractéristique est très importante dans n’importe quel projet d’éclairage, mais dans le cas des grandes espaces il est fondamental car les luminaires peuvent être en fonctionnement pendant toute la journée. La technologie LED permet d’avoir un rendement dix fois mieux que des halogènes traditionnels et on peut économiser jusqu’à un 80% dans la facture d’électricité. Si on a besoin de plus d’avantages grâce au modèle 51533 High Power de JISO Illumination, il est un luminaire avec un niveau d’étanchéité parfaite, parce qu’il est protégé contre l’humidité, la poussière et les particules étrangères. 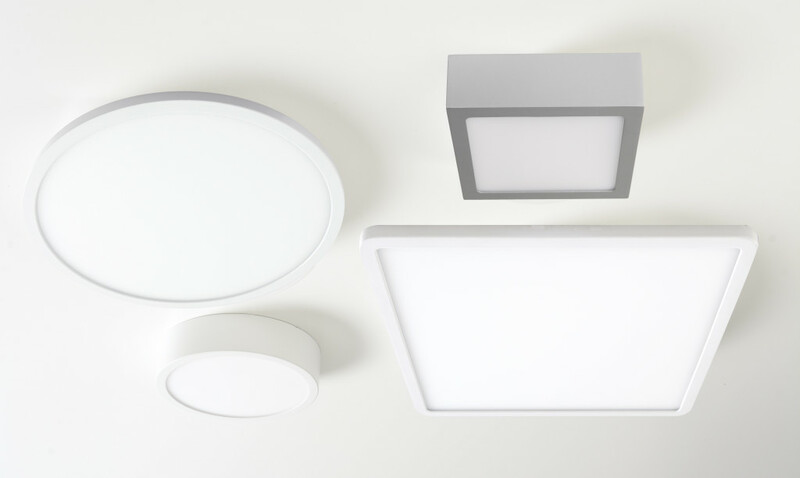 Les luminaires sont faciles à installer sur surfaces encastrés ; en plus, on peut avoir un kit d’émergence, qui permet un éclairage de courtoisie d’entre 3W et 7W, ce kit active le système en cas de panne de courant, par contre il n’est pas recommandé son usage en cas d’émergence. Le modèle 51533 High Power de JISO Illumination c’est la solution parfaite si on cherche un produit versatile et de qualité. Avec ce modèle on pourra éclairer parfaitement n’importe que grand espace, au même temps qu’on peut faire des économies dans le consume d’énergie.